So far in their relatively brief history, the hobby hasn't thought too highly of the Colorado Rockies and their top players. Even for guys like Todd Helton and Larry Walker, perennially a pair of the most consistent hitters in the game, they get respect but not a lot of attention. Troy Tulowitzki cards and memorabilia look to be following a similar path. Despite decent numbers and a torrid start in 2014, he's still affordable save for a couple of top cards and extreme rarities. 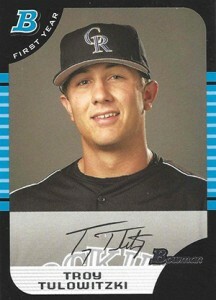 The first mainstream Troy Tulowitzki cards were released in 2004 from his time with USA Baseball. He has a national team jersey card in the 2004 SP Prospects National Honors insert set. The shortstop also has a base card, autographs and autographed memorabilia cards in 2004 Upper Deck USA Baseball. Troy Tulowitzki rookie cards came in 2005. He appeared in a handful of late-season sets from Topps not long after the Rockies took him in the first round of the 2005 draft. While Tulowitzki has been a leader on the Rockies for a while, his emergence as a legitimate MLB superstar is still very new and still a little in question. Combine that with the thin air in Colorado and his age and it's unlikely that any of his cards will enter the stratosphere for any prolonged period of time. Like Helton and Walker before him, expect respect from the masses but not a hobby hero. That said, most Troy Tulowitzki cards can be found for reasonable amounts. This includes almost all of his rookie cards. 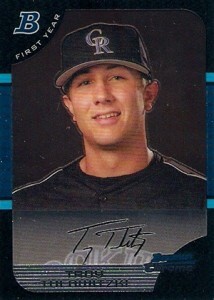 This is the most basic (and cheapest) Troy Tulowitzki rookie card. It's a base card without any flash save for the foil highlights on the Bowman logo. An upgraded version of the base Bowman card, this one is done in chromium. That said, it's still very affordable. Collectors looking for a chase will want to hunt for the handful of Refractor parallels. 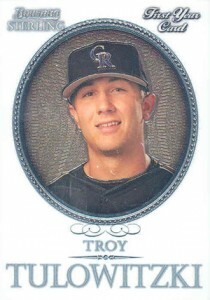 As far as base Troy Tulowitzki rookie cards go, this is the rarest. Since its debut, Bowman Sterling has been a high-end brand that proves to be relatively tough to find on the secondary market after the initial rush is over. Like Bowman Chrome, there are Refractors as well that can go for large amounts based on their rarity. 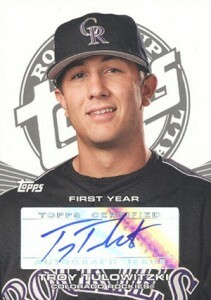 The 2005 Topps Rookie Cup Troy Tulowitzki is his only rookie card that's autographed. Produced at a time when foil stickers were used regularly among card companies, it's not the most attractive card. Parallels with different colored backgrounds also exist. 2007 UPPER DECK GOUDEY#55 RED BACK ROOKIE TROY TULOWITZKI CARD GRADE A"10"